On the initiative of the Student Senate at Manor College, a campus food pantry is now ready to serve. 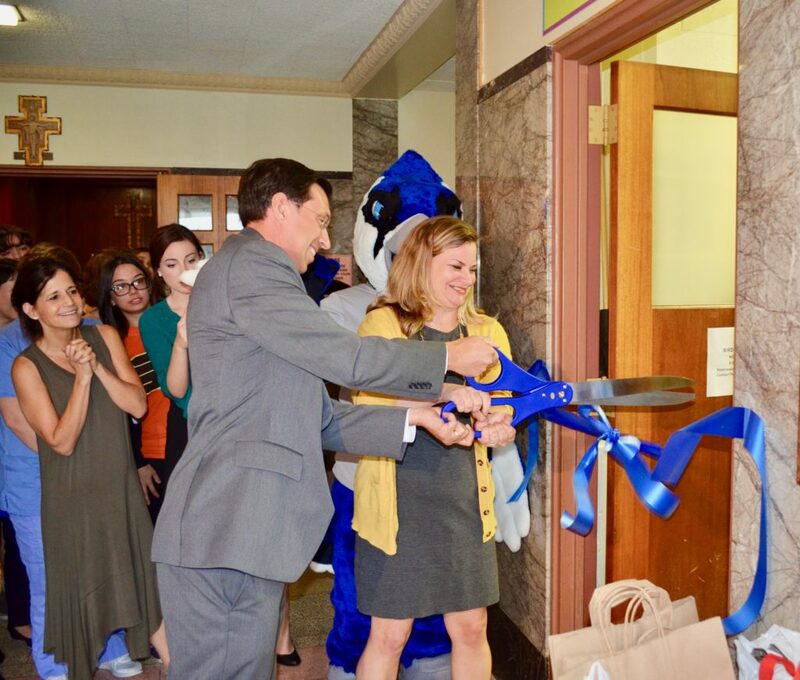 President of Manor College, Jonathan Peri and Dean of Students, Allison Mootz cut the ribbon which symbolizes the official opening of the Bird Feed. A recent article in The Chronicle of Higher Education reported that every day, college students across America are struggling with food insecurities. Last spring the Manor College Student Senate brought this issue to the attention of the college’s administration. The Manor student body was surveyed and they uniformly felt that addressing food insecurities was a worthy campus outreach effort. The college’s mission statement includes: “Manor graduates are prepared to serve society effectively and compassionately;” the campus culture and community at Manor are dedicated to serving students of all capacities effectively, compassionately (and quickly) too! 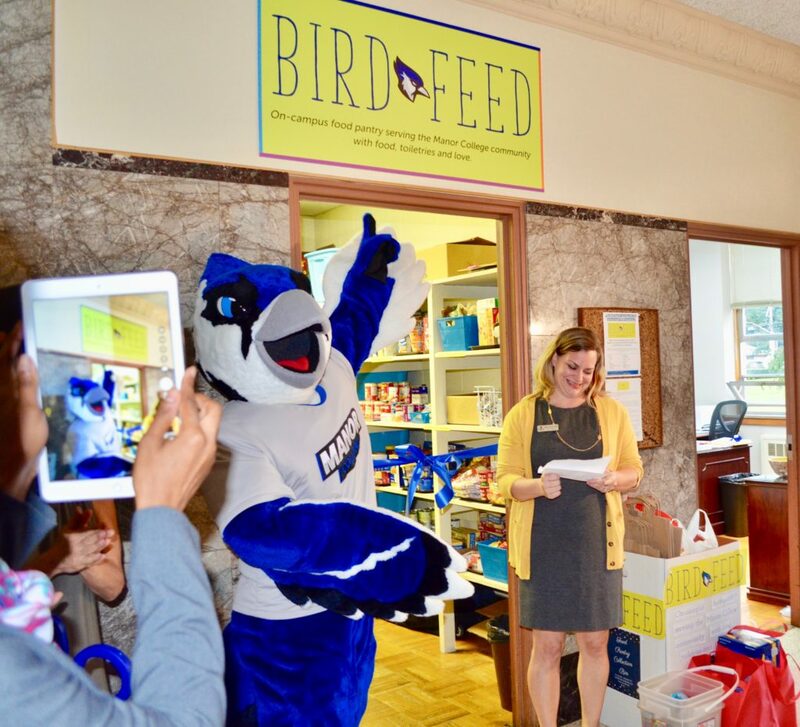 After Mootz’s summer of bringing the pantry together with a number of faculty and staff members, the Bird Feed is now open and ready to serve! Today’s ribbon cutting and blessing symbolizes the Bird Feed’s official opening and will meet immediate needs by providing a variety of non-perishable food items and basic necessities. The pantry is located in Mother of Perpetual Help Hall on the second floor across from the campus Chapel and will be open Monday – Friday from 8am – 6pm. During the Summer, the Bird Feed collected hundreds of non-perishable items. One faculty member bought and donated a new freezer. Others donated shopping bags and organizational/storage items to make the Bird Feed as accessible and friendly as possible. The administration also secured a recurring donation to the Bird Feed from Panera Bread, which is gifting leftover breads every Wednesday. The Bird Feed will be collecting items and restocking on a regular basis. Just last week, the Bird Feed received a $500 grant from the WAWA Foundation to purchase food and organizational supplies! The college is seeking new partnerships with food stores, foundations and nonprofit organizations that would like to help serve the students. All donations are appreciated and will be used to help combat community food insecurities. Inquiries and offers of donations and support can be sent to birdfeed@manor.edu. Click here to watch a segment on NBC10 about the opening of the Bird Feed!